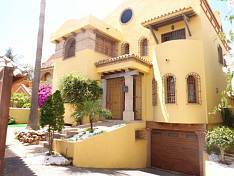 A beautiful, luminous, 2 stories corner townhouse situated in the gated complex and with camera vigilance, well maintained garden areas and large swimming pool. In the complex there´s a bar/restaurant and a "mini supermarket". The house consists of an entrance hall, fitted kitchen, shower/WC/laundry, living room with open fireplace and with access to West facing covered terrace and garden and dining area. Upstairs master bedroom having access to West facing terrace with sea views, second bedroom has a East facing French balcony. Sport Club (tennis, paddle, squash, gym etc.) and 9 hole "pitch and patch" golf course, driving range and few restaurants in walking distance. In the Urbanization Sitio de Calahonda there are all the services from supermarkets to doctors. Puerto Cabopino boat harbour and sandy beach in easy reach, aprox. 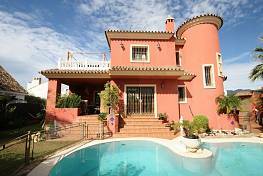 To Marbella and to Fuengirola 15 km and to Malaga airport half an hour drive.